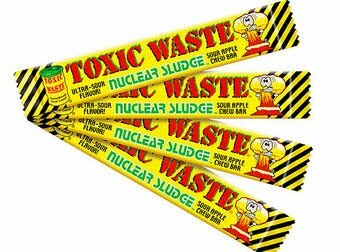 Obsessive Sweets: Warning: Toxic Waste Nuclear Sludge Chew Bars Are Actually Toxic! Warning: Toxic Waste Nuclear Sludge Chew Bars Are Actually Toxic! Oh, the irony. The news hit today that Toxic Waste Nuclear Sludge Chew Bars- motto: "hazardously sour candy"- are really and truly toxic to humans due to high lead content. Lead in my candy? Really? Read more from the New York Daily News. Good & Fiery: Taste the Heat!